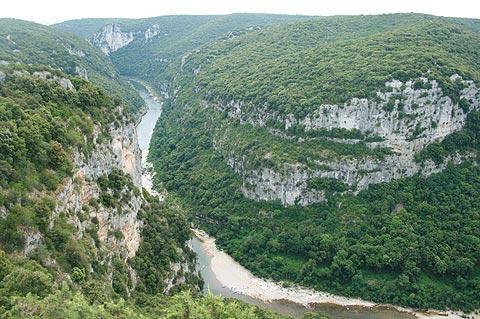 The Gorges de l'Ardeche are in the Ardeche department of the Rhone-Alpes. 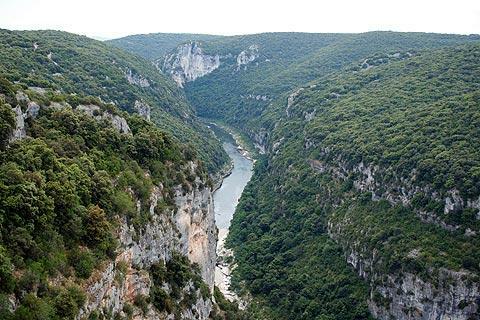 The gorges runs about 40 kilometres eastwards from Pont d'Arc (itself a few kilometres east of the popular resort of Vallon Pont d'Arc). 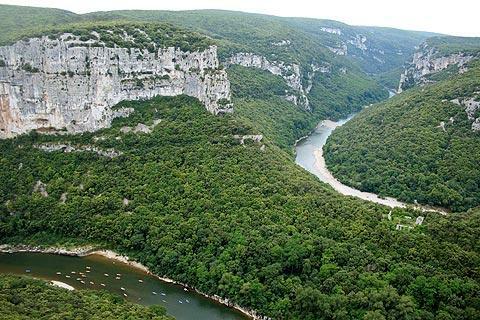 One of the most stunning scenic highlights of France, they are usually accessed from the town of Vallon Pont d'Arc at the upper (north-west) end of the gorges. 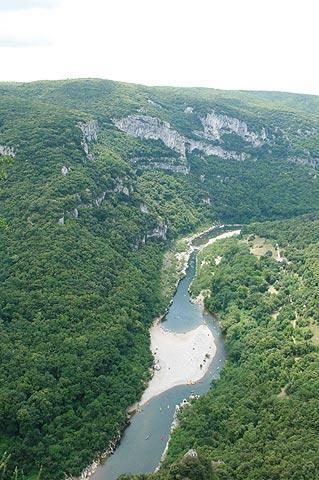 Perhaps the best way to explore the Ardeche gorges, and to get a real sense of their grandeur and beauty, is by descending in canoe from Vallon Pont d'Arc to Saint-Martin d'Ardeche - about 35 kilometres, with cliffs either side up to 300 metres in height. This is a very popular trip, and several canoe companies operate along the river. After reaching your destination you are collected and returned to your car. The Vallon Pont d'Arc tourist office recommend April, May and September as the best times of year to make the descent. 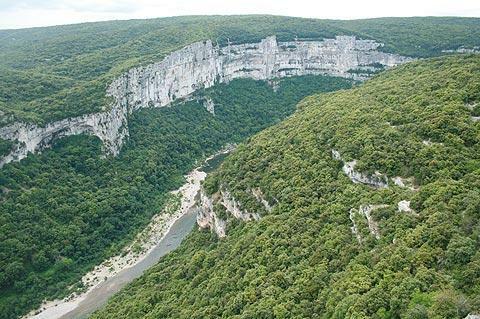 Running along the northern edge of the gorges, and with numerous very impressive viewpoints, is a road that is very popular with visitors. There are lots of places to pull over and take in the scenery and take hundreds of photos, each better than the one before. One particular highlight - and one of the few to be less obvious from the road - is the Belvedere de Madeleine. The last great viewpoint at the western end of the gorges, you need to walk a few metres off the road along a track to reach the viewpoint. I haven't listed all the viewpoints here for the simple reason that although they are marked on maps they are not marked along the route itself, so identifying which is which can be confusing and is probably unnecessary anyway. Note: unlike the Gorges du Tarn, there is little in the way of towns and villages to explore along the way. I noticed a sign for a naturist beach...I'm not sure how that works when there are hundreds of canoes on the river, perhaps it is slightly tucked away out of view, I didn't check it out. To add to the excitement of a visit the erosive forces of the river have also carved a large number of canyons and caves into the rocks. Highlights among these along and close to the Gorges de l'Ardeche are the Grotte des Tunnels; the Pont d'Arc (a natural stone arch over the river, and very popular swimming beach); the Museum of the World at the 'Aven de Marzal'; the Grottes de la Madeleine; the Grottes de Saint Marcel; and the Aven d'Orgnac (probably the best caves in the region, and a designated Grand Site of France). So there is always somewhere cool to escape from the heat outside. 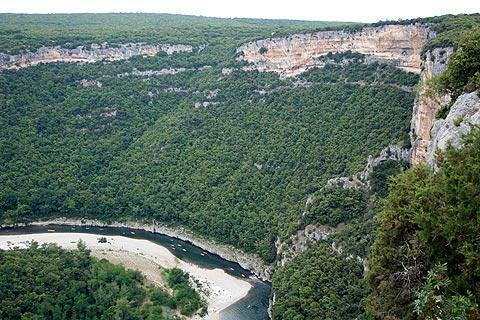 The area around the gorges is designated as the Natural Reserve of the Gorges of the Ardeche. Although there are no villages along the gorges themselves, the Natural Reserve contains a great deal of lovely scenery and several ancient villages which are very interesting to visit. 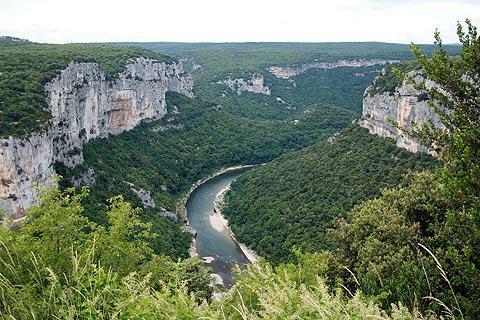 France This Way comment: because the main road along the gorges follows the northern rim it is easy to forget that the scenery and villages are just as attractive to the south of here - allow time to explore both! 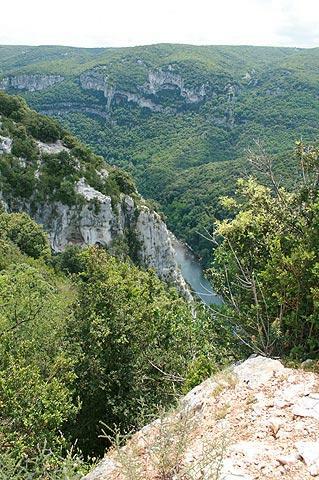 To the north, still in the Ardeche department, our favourite villages include Labeaume and Saint-Montan. To the south of the Gorges of the Ardeche we particularly recommend you visit the villages of Montclus and Aigueze: these are in the northern Gard department and both listed among the 'most beautiful villages in France'. 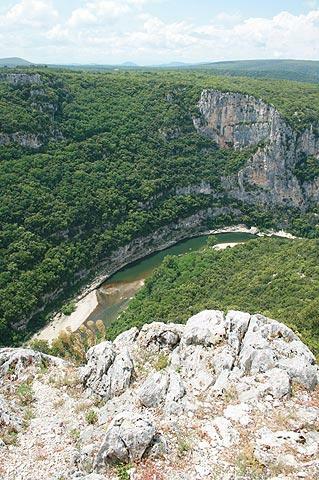 You can find more local travel ideas in the Ardeche guide and the Rhone-Alpes guide.